As a horse gets older his digestive system becomes less efficient so he may no longer obtain the full nutritional benefit from the feed he gets. 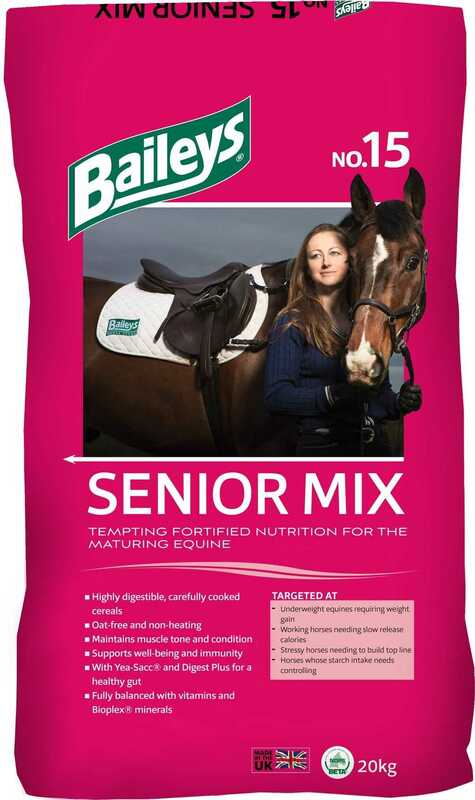 If you notice that your older horse is not looking quite as good as he used to on his current diet, it could be time to step up to a specially formulated feed, like Senior Mix.This provides readily digestible, non-heating calories so should promote a little more condition than a high fibre, low energy feed and, with its excellent levels of quality protein, should also help promote improved muscle tone, which can start to fade as the years progress. Yea-Sacc ® is included to help stimulate fibre digesting bacteria, whilst Digest Plus prebiotic feeds beneficial bacteria to help promote gut efficiency.For overall health and well-being, Senior Mix contains a full profile of vitamins and minerals, including chelated (Bioplex®) minerals, which are more easily absorbed and utilised by the horse’s body, plus soya oil for a healthy coat.Garlic adds its familiar aroma and flavour to this mix and helps tempt the fussy feeder or those receiving medicines or additives in their feed.